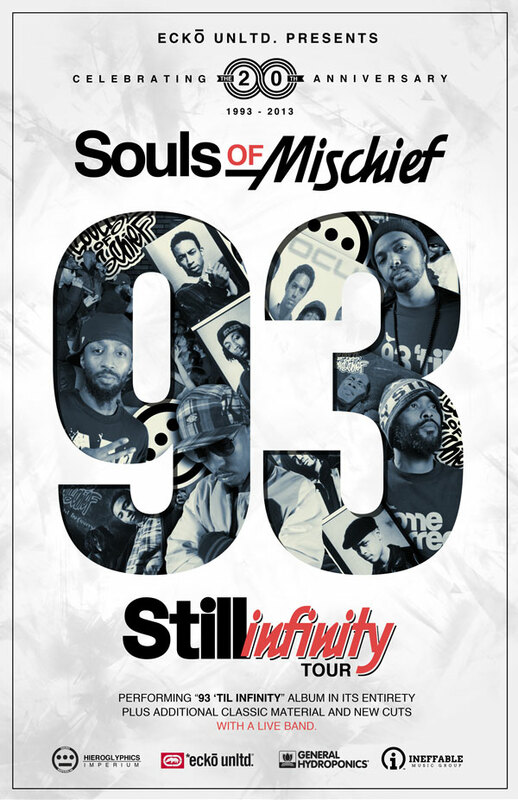 It’s astonishing to believe that is has already been 20 years since Oakland, CA rap group Souls of Mischief released their debut album 93 ‘Til Infinity. In celebration of their 20th anniversary Tajai, Opio, Phesto and A-Plus are going on a national 50-city “Still Infinity Tour” starting in Nebraska on June 18th. Souls will tour with a 7- piece live band and perform the entire album from beginning to end plus rare cuts and new tracks. To commemorate this anniversary, the four-man crew will also release a remix of the single “93 ‘Til Infinity” featuring an all-star roster of talent (names to be announced this summer.) They will also act as brand ambassadors for a limited capsule collection with iconic fashion and lifestyle brand Ecko, who also turns twenty years old this year. The tour gives fans the opportunity to not only get limited Hiero merchandise but also a chance to preview upcoming material. Fans are also granted the option to purchase an Infinity Package ticket which allows them to meet the group after the show, receive an autographed commemorative poster, and sticker at StillInfinity.com. The Hieroglyphics collective which includes Souls of Mischief, Casual, Del the Funky Homosapien, Pep Love, and Domino will release The Kitchen LP on July 16th. 6/22 Rock Island, IL @ The Rock Island Brewing Co. Please contact Michelle or Dan if interested in talking with Souls of Mischief.